Aquacure has a range of options for commercial water filtration. We assess each individual situation, and custom build solutions for commercial water filtration. Aquacure offers quality polypropylene and stainless steel cartridge and bag filter housings. These filter types have application in areas from aquaculture to pre-filtration for Ultraviolet and Reverse Osmosis systems, as well as general commercial, agriculture and industrial duties. Stainless Steel Housings are suitable for high pressure, high temperature and high purity applications. This includes renal dialysis and pre and post-filters, medical, pharmaceutical, and beverage and juice filtration. 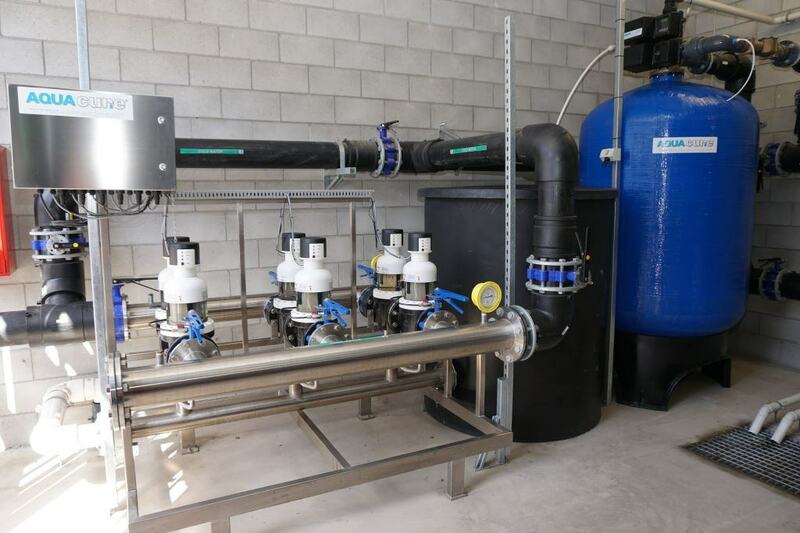 Aquacure offers a range of manual and fully automatic backwashable deep bed filters of various sizes, media and valve configurations. Media options include sand, mixed-bed, multi-media, NextSand, Turbidex, zeolite, and more. Valve options range from manual to fully automatic with latest generation controllers for optimum backwash performance and water efficiency. Judo Self-cleaning Screen Filters prevent dirt, sand and rust particles from entering a system, helping to avoid costly damage to pipes, fittings and fixtures. The Judo range employ a unique backwash process which means there is no interruption to water flow during cleaning, and there are no cartridges to replace. Aquacure offers a range of manual and automatic backwash self-cleaning screen filters. Judo ‘Speedy LongLife’ Auto-Backwash Screen Filter: entry-level self-cleaning screen filter with automatic backwashing process, degree of contamination visible, and a continuous water supply to service. Also available in manual backwash version. Judo Profi JPF Series Screen Filters: ongoing filtration, no interruption to water flow, adjustable pressure differential controlled screen cleaning option, efficient screen cleaning ratio of 1:1. The backwash cycle on Judo Filters can be initiated manually, by timer, or by pressure differential control. Fully Automatic Models: current generation GE Autotrol valve with fully programmable GE Logix 742 electronic time-clock controller. Automatically backwashes, purges/rinses and returns to service at pre-determined intervals of 0.5~99 days. The control uses safe 12volt power from the wall mount transformer supplied. Manual Rotary Valve Models: economic backwashable filters, simply turn the handle to backwash, ideal for sites where electric power is not available, pre-filter is recommended for sediment or suspended solids. In-Line Flow-Through Models: ideal for sites where electric power is not available, suitable for waters with nil to low iron and suspended solid levels, pre-filter is recommended for sediment or suspended solids.